How can they tell we’re tourists? Why is everyone wearing trousers when it’s so hot? Two of the questions I have overheard recently as temperatures rise in Rome. Spring to summer is culturally treacherous, exposing the tourist and the new to Rome to mocking, haughty superiority and sweaty decisions. When temperatures can reach almost 40 degrees in high summer, with disgustingly high humidity, you (and your clothes) have to pace yourself. You must acclimatise. You really can’t go summery too quickly. It’s the law. 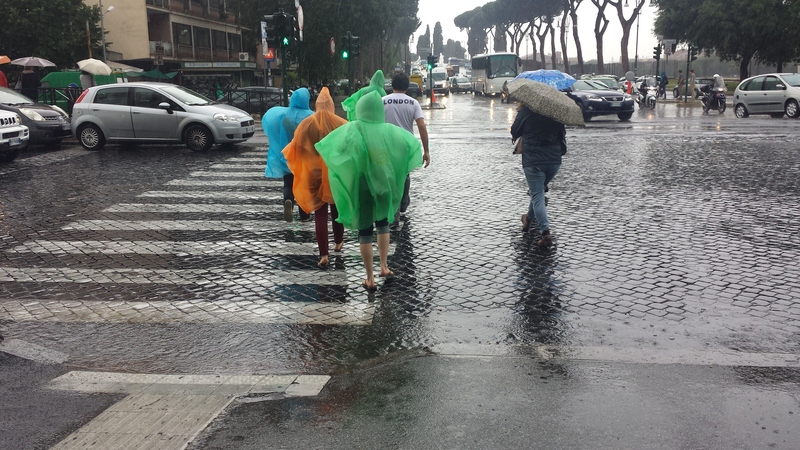 My Italian friends worry when they see tourists in May in strappy dresses and sandals, “What will they wear in July and August?” they ask aghast. No toes out until June advises Roberta. You’ll regret it come August if not. They don’t realise of course that for us temperatures of early 20 degrees are more than enough reason for summer wear to appear – when else would we be able to wear our summer clothes if not? This is why you shouldn’t be wearing shorts and flip flops in May. Shivering tourists yesterday. But, I’m beginning to have some sympathy with Italians. If you’re coming to Rome for a visit, try to remember it’s a city – you’re not at the beach. Yes you might be on holiday, but the rest of us are not. And this makes us grumpy. We should be at the beach – which is where you should go if you want to wear beach clothes. 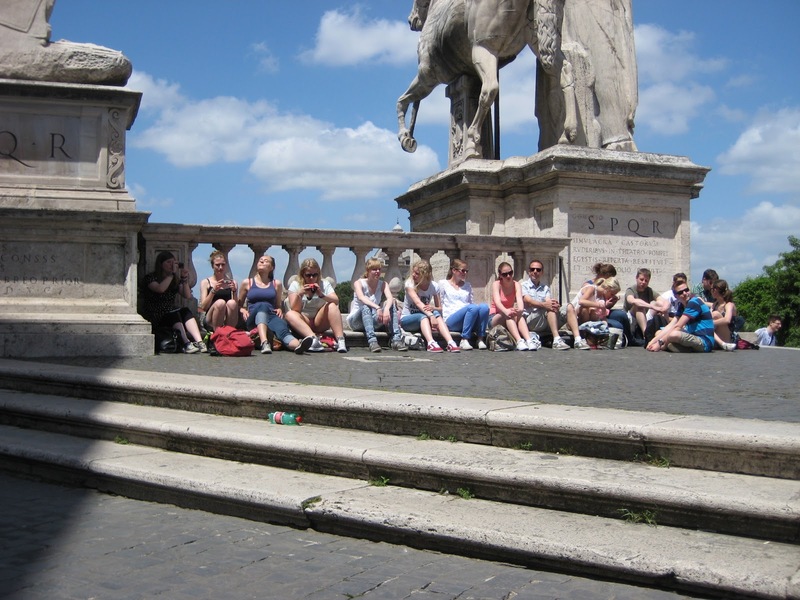 And if you want to know why everyone does seem to be wearing flipflops as you wander around Rome, it is because these people are foreigners. Italians are fashion fundamentalists and follow the rules about seasonal clothing with almost the same rigidity as they do about food. No one is told of these unwritten rules. You should just know. There isn’t really a dress code anywhere because people know without having to be told. You learn, but often the hard way. On my first trip to Rome, years before I moved here, I was so taken with the idea of La Dolce Vita that I decided a 1950s-style bright red dress would be an appropriate outfit for a local pizzeria in the very untouristy area of Marconi. I was wrong. Trying far too hard. Whereas 5 years ago I wouldn’t have even noticed people wearing flipflops, now I’ve almost got a phobia about them. Here is why you really shouldn’t be wearing them in Rome. Roman streets are filthy. My first week here I suffered the notorious black foot. Look down – you look like you’re wearing little black socks. Italians only wear them to the beach or in the house. It’s like going out around town in your slippers. They are extremely bad for your feet, especially on cobblestones and Rome is made for walking. Rome breaks bad shoes. They won’t survive. Rome is the eternal city not a surfy paradise. 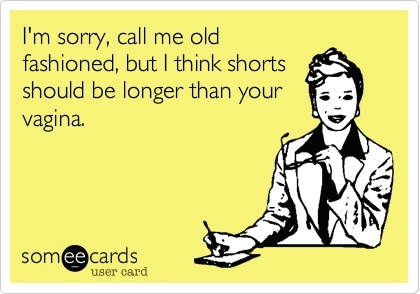 I know teenage girls get very upset when old grandmas like me tell them that their shorts are too short (and maybe not having ever had an appropriately peachy enough behind makes me a little jealous) but seriously we do not need to see your bottom hanging out all over the city. We do not need to see you uncomfortably picking your shorts from out of said bottom. You will chafe in the heat. These are just two of my personal favourites, any other tips? Previous International Workers Day, Primo Maggio or May Day. Wherever and whenever you celebrate do it with Pride. Next Naked Tourists – are they ever acceptable? And do they really cause earthquakes? this is brilliant and I am the same – never, ever, go out in flip flops. Ok, occasionally to throw out the trash at about 11pm. They just feel wrong.